Stéphane tells us how he always had to go looking for new bass players as Django kept giving them the sack ! 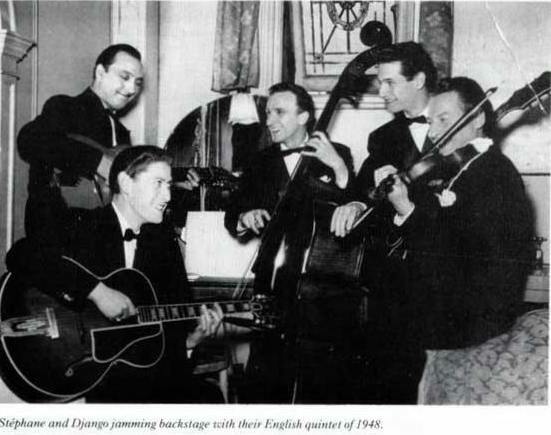 The 1st engagement Vola obtained for Django was with his band at the Palm Beach Casino in Cannes and Reinhardt started as he meant to carry on by often failing to turn up for the gig and flooding the area with the caravans of his many “cousins”. Despite this behaviour, Vola knew Django was something special and worth nurturing even with the inevitable aggravation and consternation that would be involved. Louis Vola was born in the Riviera town of La-Seyne-sur-Mer on 6th July, 1902 to an Italian shoe maker. He first started to play his father’s accordion and became passably competent on several instruments. His visits to the bal musettes fired his enthusiasm for music and after a brief spell as a baker, Vola learnt to play the double bass and became a full time musician. He often acted as the peace maker between Django and Stephane but later expressed the view that their continual squabbling was very tiring. “I felt like leaving them to get on with it” he said. 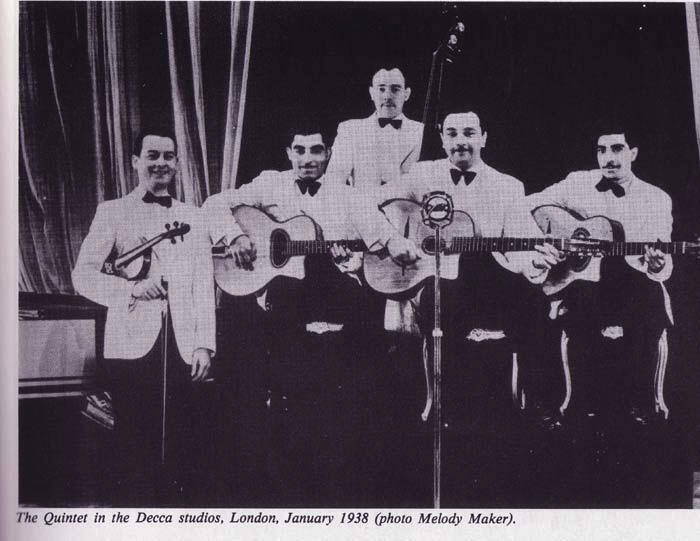 By the outbreak of War, Vola was playing regularly with the Ray Ventura Orchestra and together with many of its members, he fled to South America where he remained for 8 years. Before doing so, he was featured in the 1939 Ventura film “Tourbillon de Paris” playing himself. When he returned to Paris, the music had moved on and left him somewhat marginalised. After a failed attempt to run a restaurant in Nice, Louis Vola joined the Scheherazade, a fashionable Russian restaurant, where he remained for 30 years. “My double bass plays by itself” he joked. Probably Louis Vola‘s greatest contribution to music was the discovery and early mentoring of Django Reinhardt and then acting as a catalyst between Reinhardt and Grappelli. However, he probably made the most of his rather limited musical ability and was, without doubt, a competent session musician working with many well known performers . Perhaps Vola’s attitude is best illustrated by the fact for his many years at the Scheherazade he was primarily the bass player but also doubled on piano and drums and was paid accordingly. In the late 50‘s he retired to Cachan and died there in August 1990. 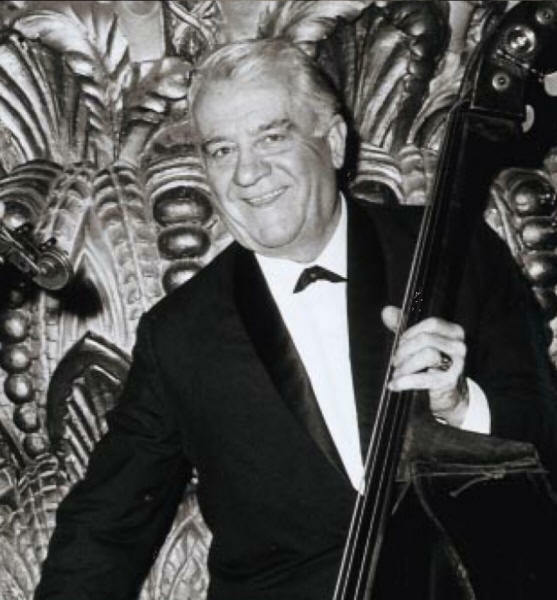 Louis Vola, the bass player with the original Quintette Du Hot Club De France, an affable, Maurice Chevalier type of man, he talks glibly of his 15-year old granddaughter who plays the piano and can relate many tales about Django. He really knew Django the longest, starting at Toulon, where Vola had a band. 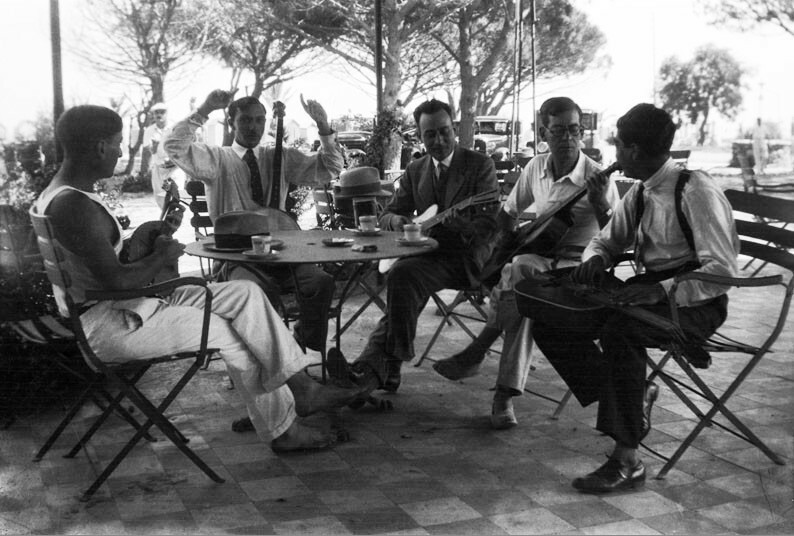 Django in the centre left with Emile Savitry (glasses) Joseph Reinhardt, Gusti Malha to the left and another unknown banjoist in Toulon, 1930. He heard the 2 gypsy brothers, Django and Joseph playing on the beach one night and invited them to jam after hours with some of the members of his band. One member of note was Stephane Grappelli. Vola subsequently moved to the Palm Beach Hotel at Cannes and hired Django alone, as an accompanist for his own accordion. Later, when Vola switched to bass, he hired Eugene ‘Nanine’ Vees, Joseph Reinhardt and Stephane Grappelli, in addition to Django – thus the Quintette Du Hot Club De France was born. Shortly after it was started on its recording career by Charles Delaunay and Pierre Nourry. Roger “Toto” Grasset on bass – indeed Grasset was in the line up of the Quintet at that time, because he had to replace Vola for a while. Grasset joined the tour to Great Britain then. Grasset had glasses, a moustache (to tell the truth he was a little bit stocky). Perhaps they changed the bass player because Grasset didn´t look like a character out of “Scarface” like Joseph and Baro did. 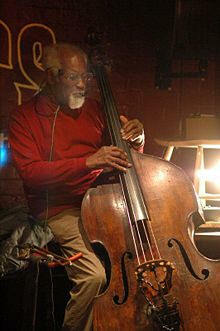 ( July 30 1919 in Liege , † October 23 2006 ) jazz bassist. Emmanuel Soudieux worked in Musette – and tango orchestras. He was known for his membership in the QHCF and since 1938 he played in the bands of Django Reinhardt and Stephane Grappelli. 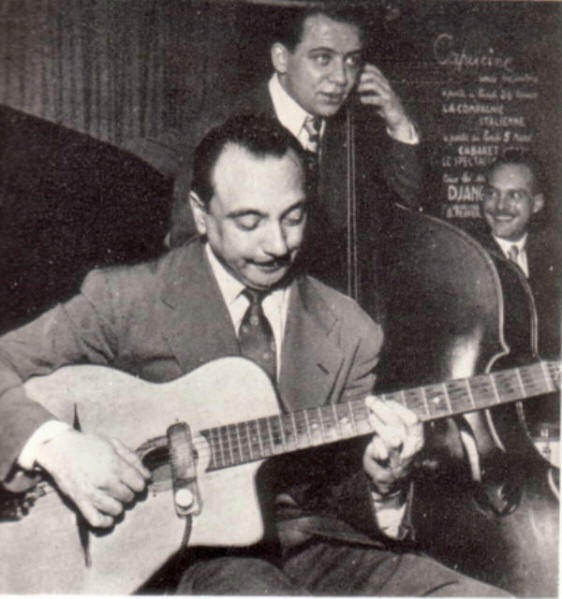 Soudieux then played intermittently until 1947, Reinhardt, as well as in the last session for “Swing” with the guitarist in November 1947, the title “Peche à la Mouche,” “Belleville” and “Manoir de mes Rêves “. About Soudieux Reinhardt once said, “he was incarnate music”. In the band of Jacques Diéval he entered the 1949 Festival International de Jazz in the Salle Pleyel on in 1950 he played in a trio with Doc Cheatham and Diéval and accompanied them with the singer Eartha Kitt . In the late 1950s he worked with Hubert Rostaing and Henri Crolla . The writer Boris Vian Soudieux counted alongside Lucien Simo , who also worked with Django Reinhardt, one of the best bass players in the immediate post-war France. Pierre Michelot was arguably the most talented bass player to work regularly with Django. He played with him during the Club St. Germain engagement in 1951 and was on the only formal Reinhardt recording session of 1952. He then appeared on Django’s last 2 recordings in March and April of 1953. Michelot was born in 1928 and learned to play the piano as a child before studying classical double bass at 16. He was attracted to jazz by Jimmy Blanton and Oscar Pettiford, both pioneers of modern jazz bass. During the late 40’s, he became a well known figure around the Parisien club circuit playing with major jazz musicians like Rex Stewart, Coleman Hawkins, Zoot Sims, Lester Young, Dizzy Gillespie, Bud Powell and Dexter Gordon. He often claimed that during the final recording session with Django, he (Michelot) had a premonition of his imminent death precipitated by the melancholic aura created by his playing, particularly on “Nuages“. He said he felt an involuntary “shiver” everytime he subsequently heard the record played. “He liked this session. I think, but when it was released almost everyone was indifferent. Yet he was at a turning point in his musical expression , and open to everything new. Changing his famous sound, he was using an electric guitar which was nothing like the makeshift instrument he had at the end of the 40’s, and his mastery of it was perfect“. 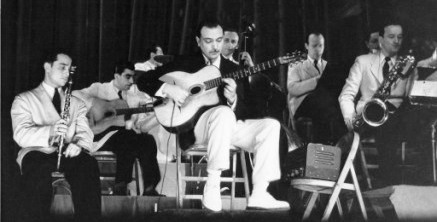 In 1951, Django Reinhardt plays regularly with a band made up of the best be-boppers French: Roger Guerin, Hubert and Raymond Fol, Pierre Michelot, Bernard Peiffer, Jean-Louis Viale. Always at the forefront of jazz, Django recorded his last record April 8, 1953, with Martial Solal on piano, Pierre Michelot on bass, Fats Sadi on vibes and Pierre Lallement Lemarchand on drums. He died 1 month later, May 16, 1953, of a cerebral haemorrhage. Personnel (from left to right): John (Jean) Ferrier p (bearing Taylor’s tp?) , Charlie Johnson tp, Eugène d’Hellemmes b, Arthur Chester Lanier cl as bs, Oscar Alemán g, Fletcher Allen cl ts,, Wiliam Diemer dm. Freddy Taylor is absent. Len Harrison was a Base Clef man, performing with vigor on both bass and bass saxophone and even picking up the odd credit, and it is an odd one at that, for playing contrabass trombone with Django Reinhardt. Not that it would be any harder to keep up with the gypsy guitarist on contrabass trombone than any other instrument. Harrison was also utilized as both a baritone and tenor saxoponist by bandleaders such as Benny Carter, an adept arranger who made good use of multi-instrumentalists. Active on the British jazz scene from the mid ‘30s, this player was eventually catagorised simply as a bassist. By this time the makings of a hefty discography already existed as the result of the aforementioned Reinhardt and Carter projects, the latter artist having organized a special large ensemble for one of his earlier European tours. Harrison was often the choice for such international mixtures, including Fats Waller And His Continental Rhythm. Also featuring guitarist Alan Ferguson, this group recorded a series of tracks in London in 1938. In 1948 Malcolm Mitchell guitarist was called on to play with Stephane Grappelli and Django Reinhardt for an 8-week tour of Sweden. All other references to this tour indicate the group was Malcolm Mitchell, Alan Mindel (gtrs) and Teddy Wadmore (bass). In fact, Mitchell wrote an article confirming that particular combination for Scandinavia. 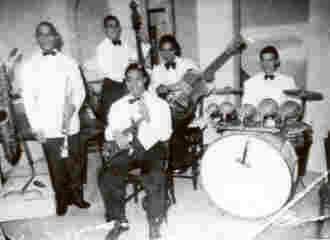 Ted Taylor on right, Bob Rogers on left and Teddy Wadmore, seated, with the very first Supersound Electric Bass (built in summer 1958) which he used on the Jack Jackson TV show in that year. One of the finest jazz bassists who has worked in Europe, he is an important link to a proud heritage of Caribbean contributions to jazz music. His achievements through a long career have been an important inspiration for some leading contemporary black British jazz musicians. In 2002, his Autobiography co-authored with his friend, the academic and jazz writer Roger Cotterilll, not only told his own story but provided poignant and vivid memories of the brilliant and tragic Saxophonist Joe Harriott and of the birth of free form jazz in Britain. Django, Allan Hodgkiss (Hodgkins) Archtop, West Indian Bassist Coleridge Goode, & Jack Llewellyn on Selmer Grande Bouche concealed by Stephane. Patrick Fallon (Jack Fallon), bassist, violinist and agent: born London, Ontario 13 October 1915; died London, 22 May 2006. “I was born in a log cabin on a 100-acre farm in Ontario,” wrote Fallon. His sister Irene Fallon, who entered a convent as Sister Rosary, had another view. “A log cabin called St Joseph’s Hospital,” she said. 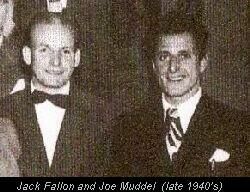 After playing violin in a family band Fallon took up the bass in 1935. He played trumpet in the air force’s band as well as bass in its dance band the RCAF Streamliners. He sent his bass back to Canada when his duties were over, but then decided against joining it. “Somebody offered me money,” he explained. He joined the Ted Heath Band in April 1946 and stayed until September. He played in night-clubs and at the haunts of the early British bebop players like the Feldman Club in 100 Oxford Street where the music was difficult for both musicians and audiences alike. “If I was having trouble I could always have a coughing spell,” Fallon said modestly.